What's your first reaction after learning that a tornado, flood, wild fire or hurricane is headed straight for your town? Unless you just need to socialize, if your response is to leave your house to buy anything--food, water, batteries, wood to board up your windows, flashlight, etc.—then you aren't prepared. In 2008, my husband and I left our well-paying jobs in corporate America to live a much simpler life. Knowing nothing about agriculture, we bought an organic farm in the interior of the Caribbean island of Puerto Rico. We told ourselves we were prepared for anything. Within three days of moving to their new farm, the water utility shut off their water so they could fix a sizable leak down the hill from our farm. The water remained off for three weeks. That day we learned some valuable lessons about the importance of truly being prepared for anything. From creating lists and forging bonds to planning weeks, months and even years out, preparedness for a natural disaster is far more than stocking up on items you think you'll need if you're going to be shut in for several days or even weeks. 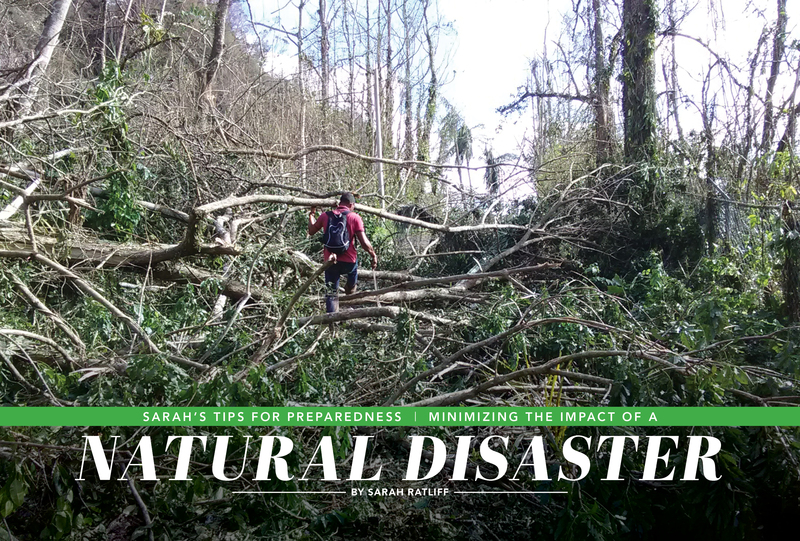 Sarah's Tips on Preparedness: Minimizing the Impact of a Natural Disaster is a guide for anyone who has to deal with Mother Nature. Sarah's Tips isn't meant to be a definitive guide. With many books on preparedness out there—most of them dense with information, eclipsing 150 pages--it's impossible to cover every scenario you're likely to encounter in 50 pages. However, Sarah's Tips will prepare you in ways you probably never imagined. The best things in life are a win-win. Sarah’s Tips for Preparedness: Minimizing the Impact of a Natural Disaster is a perfect example. Many of my friends here on the “mainland” have wanted to help the crisis in Puerto Rico, but have been unsure how. The answer - buy this book! Not only will proceeds go to two non-profit organizations, but you might learn something as well. We all think “it” won’t happen to us. But the reality is that it is not a matter of “if” but “when” we will experience some kind of disaster, big or small. Here in Michigan, huge storms are not as common, but we still experience flooding, snowstorms, windstorms, tornadoes, and even the occasional (albeit weak) earthquake. Even if something happens locally to your own house or neighborhood and you lose power for only a day or two, these tips will help it be a minor blip rather than a major inconvenience. And if the worst case scenario happens, you will be ready for that too. What makes this book different is that it is not focused on high-cost strategies, or becoming a “prepper.” It is common sense and practical for anyone. And Sarah understands that it starts with how you think about the world first, and then the action you take second. I also appreciate that it is a shorter book. While longer preparedness guides can teach you a lot of interesting things, you will probably never get through all of it. This is a guide you can read and instantly implement to get the most important things covered. And with 100% of the proceeds benefiting two non-profit organizations on Puerto Rico, it's a win win for everyone! Sarah's Tips for Preparedness: Minimizing the Impact of a Natural Disaster is available in English and Spanish and on Kindle and paperback.